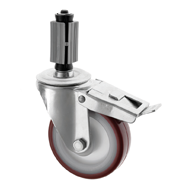 This is by far our most popular range of bolt hole castors, as not only can we offer you a variety of sizes of bolt hole castors, they can also come as complementary sets of swivel castors and braked castors. 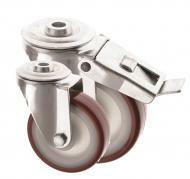 With 5 different wheels to choose from there will be a bolt hole castor in this range that suits your application. 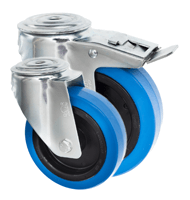 These castors are zinc plated pressed steel for durability, and have a bolt hole attachment rather than a square top late, suitable for a single M12 bolt. 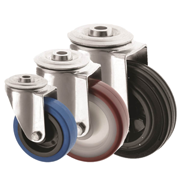 This 4000 Series of bolt hole castors can also be teamed up with our tubular adaptors accessories, which means these castors can easily and securely be attached to round or square hollow tubes. 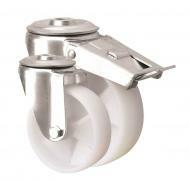 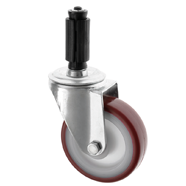 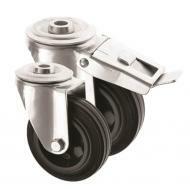 This makes these medium duty bolt hole castors suitable as furniture castors, equipment, stands, framework, trolley castors and conveyor castors. 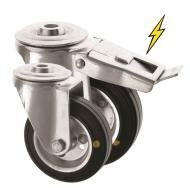 They are a flexible medium to heavy duty castor that can take loads, depending upon its size, up to 200kg each! 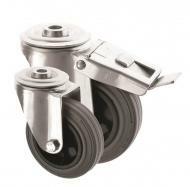 With either a swivel bolt hole castor or a swivel braked castor these can team up on any application.